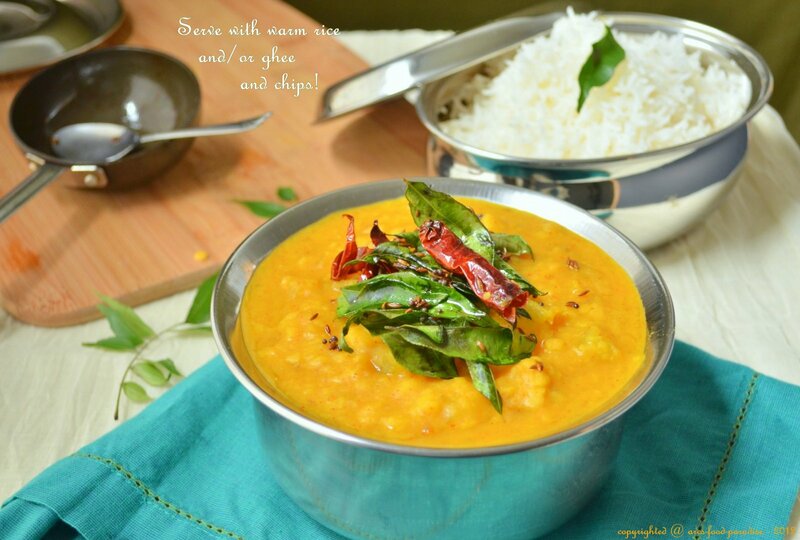 Dosakai Pappu/Yellow Cucumber Dal | The Flavor Nook! The idea of ‘comfort food’ certainly varies from person to person. It could also vary by season. In spring, a generous slice of your favorite cake with some hot coffee/tea could be your company while you stare at the beautiful blossoming flowers; In summer, a double scoop of ice-cream could just be what you need to beat the scorching heat; In fall, a considerate piece of apple pie or pumpkin pie with a dollop of whipped cream could be necessary to put you at ease while you watch the leaves wither away leaving all the trees barren; and, In winter, a hot bowl of soup or warm rice paired with hot rasam or dal could be something you need to keep you warm inside while you curl up on your sofa under a blanket! To me, a bowl of warm Maggi (Indian noodles) or some warm rice mixed well with rasam or dal is ‘THE’ comfort food irrespective of season or mood. Even when there are fancier dishes on the table, I am always drawn towards dal – let it be any kind – Tomato, Spinach/Palak or this one. ‘Lentils’ are a very important part of regular Indian diet and they are such a good source of proteins, that I think they should be a part of everyone’s diet. There are different kinds of lentils I cook on a regular basis. I use ‘Toor Dal’ and ‘Moong Dal’ to make Pappu/Dal, Sambar, Pappu Charu, ‘Chana Dal’ to add crunch or for tempering and ‘Urad Dal’ to make dosa, idli and vada. ‘Dosakai’ is a yellow cucumber that is primarily grown and widely consumed in India. It will most likely be found only in Indian or other Asian grocery stores. 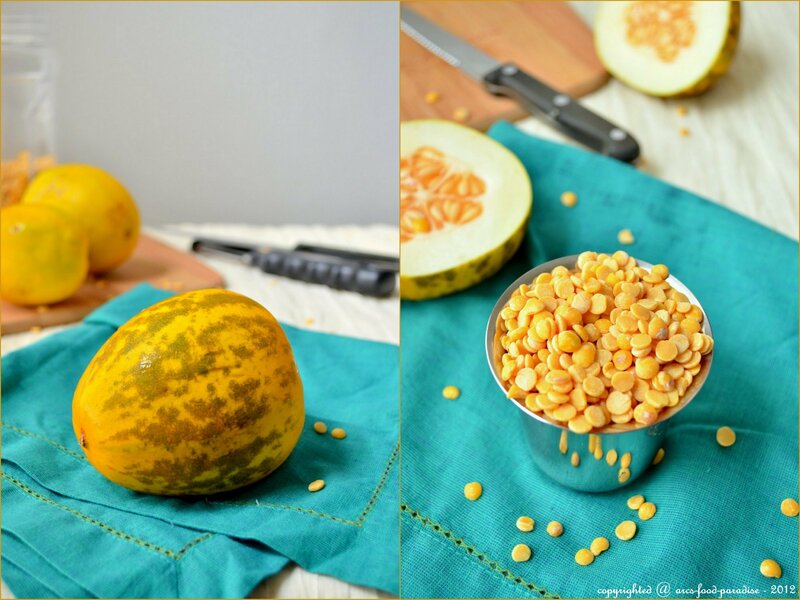 It is similar to other kinds of cucumbers in the looks but has a yellow outer and has a little tangy taste which is what makes the dal really tasty. 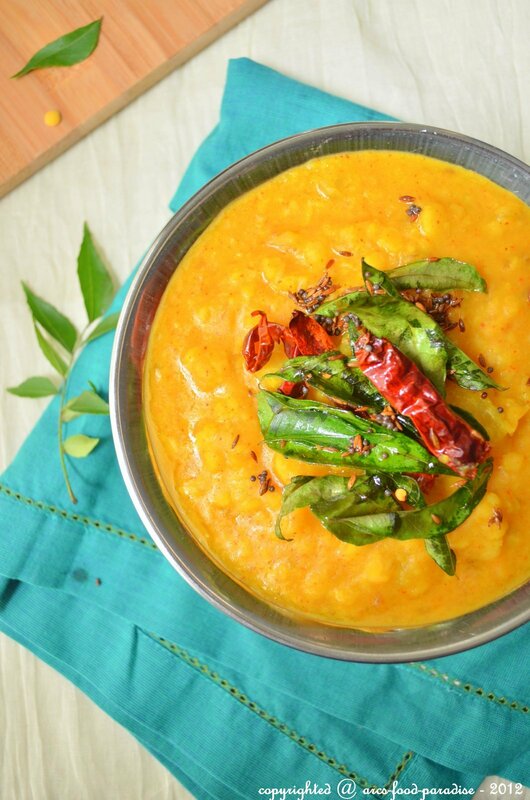 It can be used to make dal, sambar or chutney. 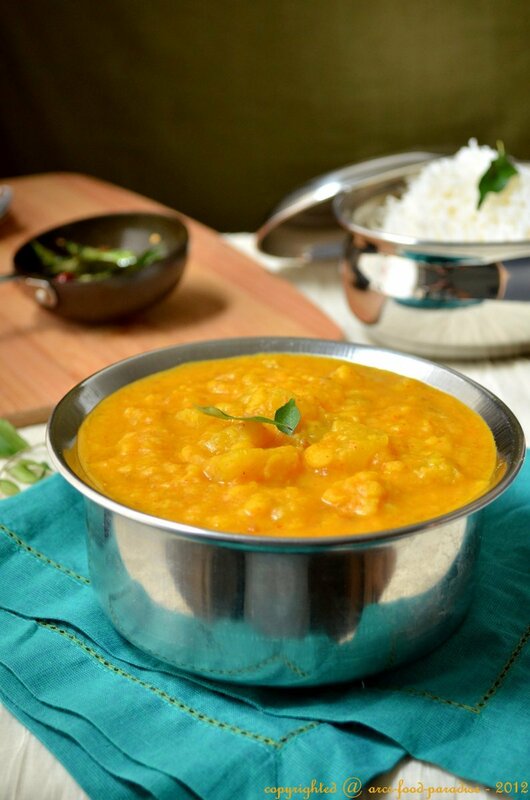 Enjoy this dal over white rice or use as a dip for some toasted bread, tortillas or rotis to make a hearty meal! 1. In a pressure cooker, take toor dal. Rinse well under running water to remove any dirt. Add 3 cups of water (~ double the amount of lentils/dal). 2. Peel the dosakai, cut in half, remove all the seeds from inside and then chop into small chunks. Lightly rinse under water and add to the pressure cooker. 3. Also add chopped onions and green chillies, turmeric powder, red chilli powder and salt. Give a quick mix. 4. Close with the cooker lid, place the whistle and cook until 3 whistles or more as per your cooker. If you don’t have a pressure cooker it’s fine, you could cook it in a sauce-pan or a wide skillet with a closed lid but it will take longer. When done, remove from stove and let the cooker cool down for at-least 5 minutes until all the pressure inside escapes out. 5. 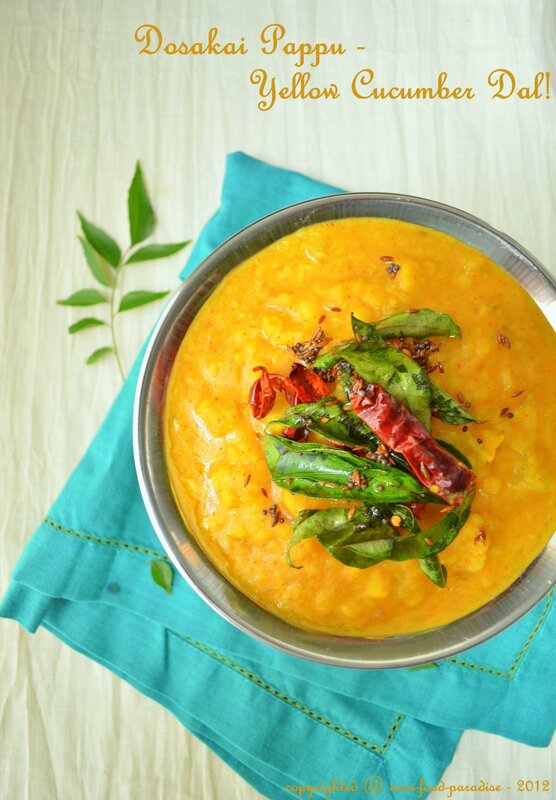 In a small pan, make the tempering to add nice flavor to the dal. Heat about 2 tsps of oil. Add mustard seeds, cumin seeds, dry red chilli, minced garlic and curry leaves. Saute for a couple of mins on medium heat and add to the cooked dal. Serve warm with plain white rice. Add some ghee and pair with chips to make a comforting meal! Dhanyavadamu! 🙂 Thanks much for stopping by! thanks! it’s a simple, tasty….colorful dish! Looks delicious! And what beautiful vibrant pictures!! !